Visitors to the city are usually disappointed when they find out they cannot enter this grand building. 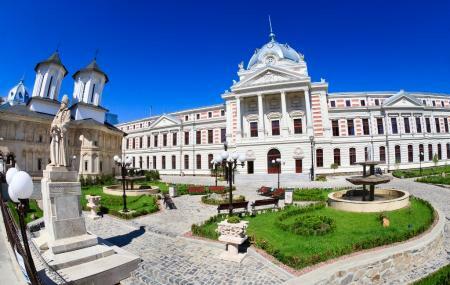 It is the oldest Hospital in Bucharest and was built in 1704 by Christian scholar and philanthropist Mihai Cantacuzino (his statue can be seen right outside the building). It is famous for having tended to the soldiers wounded in the many battles of Romanian history, most recently those injured in the Romanian revolution of 1989. Don't break a leg. Since this is still a functioning Hospital you may only view it from outside. Only those with medical reasons can enter. Buses 61, 66, 69, 70, 85, 90, 91, 336, 610, N102, N108 stop Teatul National. Metro M2 line stop Universitate. Buses 6, 16, 21 stop Piata Sf. Gheorghe. How popular is Coltea Hospital? People normally club together Parcul Alexandru Ioan Cuza and Bellu Cemetery while planning their visit to Coltea Hospital. One of the best hospitals in the city, maybe the whole country, with professional doctors who do their job impeccably. The hospital was built in the 17th century but looks so modern and up to date. And it is very clean and safe. When you arrive here, you better be prepared. It will not be pleasant at all. In my opinion this is the best hospital in Romania. A historycal building which looks amazing. Doctors are great and everything is "almost" perfect. One of the most modern hospitals in the country. Incredibly clean, with well respected, professional doctors.